The Peghead of a gourd banjo gives the strings something to anchor to. It needs to be big enough and sturdy enough to accommodate the working of the tuning pegs. 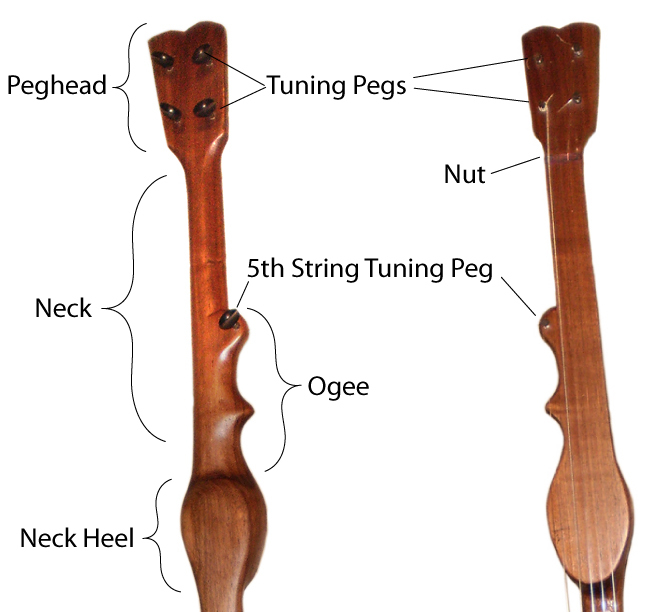 The Tuning Pegs I use with gourd banjos are friction pegs much like those found on the violin. The friction peg is a simple idea, just a tapered peg in a tapered hole. The fit between the peg and hole determines how well the friction peg will work or not work. I use ebony or rosewood pegs. The Nut gives the strings something to rest on. The slots cut into the nut keep the strings from moving from side to side during play. The nut should be made from a dense material like hardwood or bone. The Neck acts as the handle of the instrument. The Fingerboard is the flattened side of the neck that allows for noting. The Fifth String Tuning Peg allows for tuning the fifth string. It also acts as a nut for the fifth string. The Ogee is purely decorative. The Neck Heel is where the neck joins to the stick. 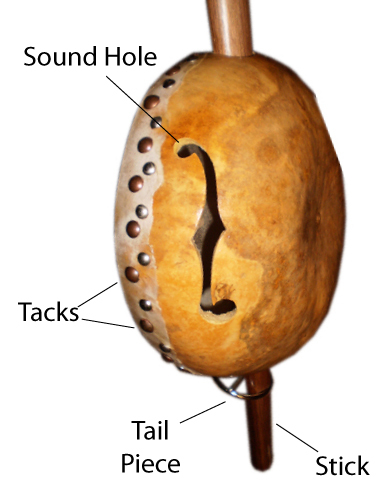 The Gourd acts as the sound chamber and frame to stretch the animal hide head across. The gourd mounts on the stick. The Head is made from goat or cow hide. It is fixed to the gourd with tacks and glue. It is the tone producer of the instrument. The tension and thickness of the head affect the tone. The Bridge rests on the head and is held in place by the tension of the strings. The bridge is movable. 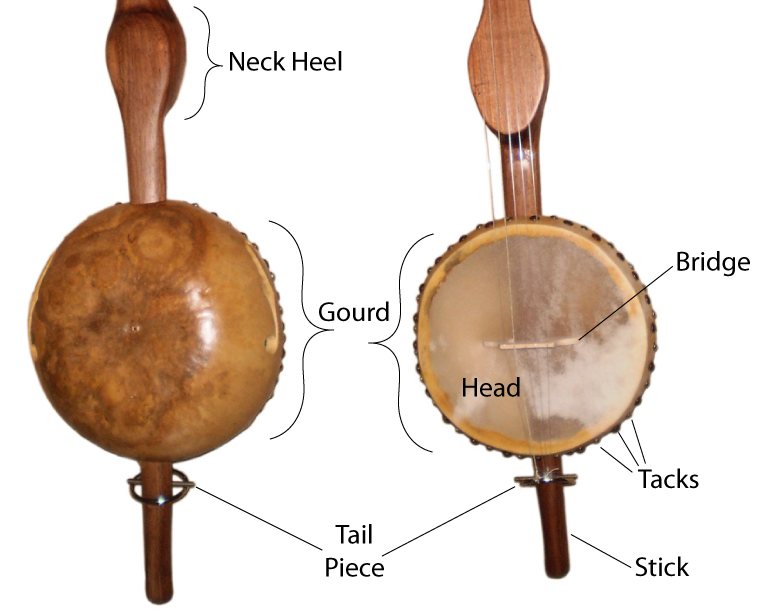 Its position on the head has a notable impact on the sound of the instrument. The Tail Piece fastens the strings to the stick. I use a cantilevered design that consists of two pieces of metal. The strings are tied on. The Tacks hold the head in place until the glue dries. After that their function is decorative. The Stick joins to the neck. The gourd is mounted on the stick. The string also fasten to the stick, on one end they attach with the tuning pegs, on the other they attach with the tail piece. The Sound Hole lets the sound out from the sound chamber. The sound hole’s size and shape affect tone and volume. Previous Previous post: Buy the Book!